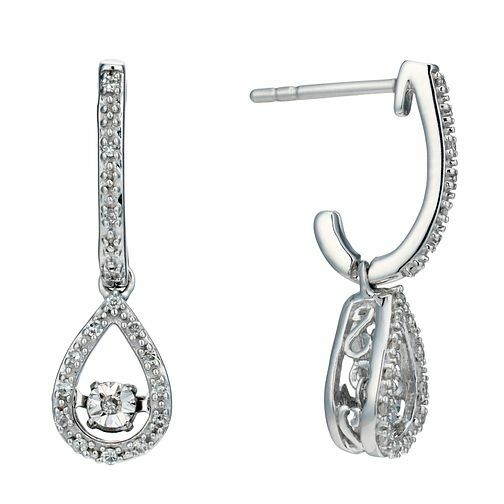 Featuring a sparkling illusion set diamond each, these glamorous pear drop shaped earrings are designed to add a touch of vintage luxury to your outfit, whatever the occasion. Sterling silver 10 point diamond pear drop earrings is rated 5.0 out of 5 by 2. Rated 5 out of 5 by Anonymous from Elegant, classic earrings for my wedding Delighted with my earrings, can’t wait to wear them on my wedding day. They are simple, classic and sparkly! Rated 5 out of 5 by Anonymous from Excellent A real sparkle in these ear rings. Not too big and not too small and the light catches the diamond constantly.